RCW 108 is a molecular cloud that is in the process of being destroyed by intense ultraviolet radiation from heavy and hot stars in the nearby stellar cluster NGC 6193, seen to the left in the photo. A series of images were obtained with the Wide Field Imager (WFI) of areas in the Milky Way band, including some in which interstellar nebulae of gas and dust are seen. Each frame records 8184 x 8196, or over 67 million, pixels in a sky field of 32 x 32 arcmin 2. 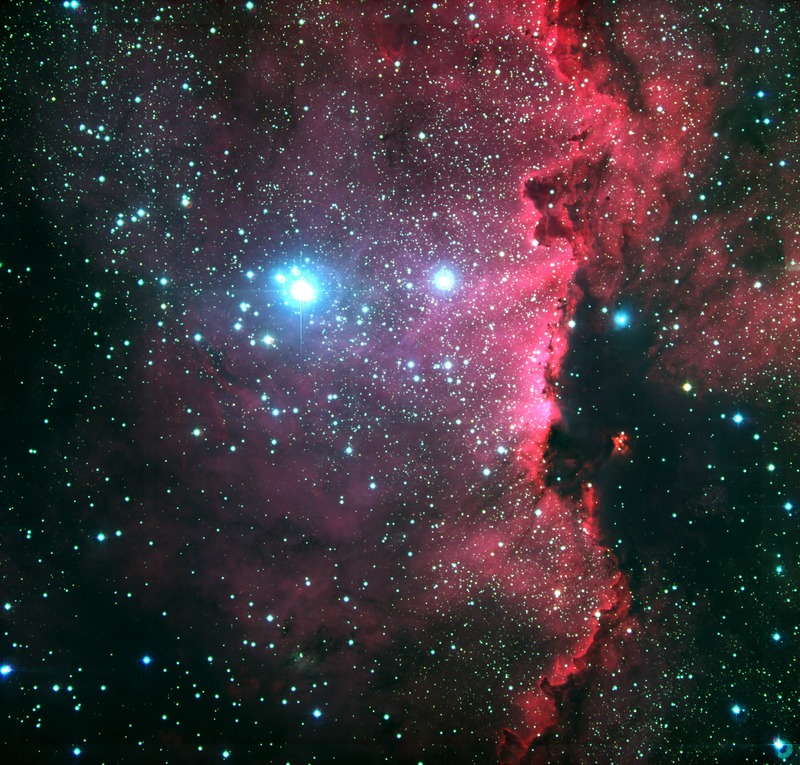 The photo shows the RCW 108 complex of bright and dark nebulae in the southern association Ara OB1, a star-forming region in the constellation Ara (the Altar), deep in the southern sky. The resolution in this image has been degraded by reducing the number of pixels in one direction from about 8000 to 3000 in the "High-Resolution version", in order to make the image transportable over the web without incurring completely unacceptable transfer times. Still, it is very large, even in the highly compressed jpeg format, reflecting the great amount of details visible. This colour picture is a composite made from 12 separate images, obtained with the WFI on 27 March 1999. The blue component corresponds to the B filter, the green to the V filter, and the red to the H-alpha filter. The images in each filter are the composite of 4 individual frames obtained with the telescope pointing at slightly different positions on the sky, so that the parts of the sky falling in the gaps between the 8 individual 2k x 4k CCDs in any given frame are recorded on the others. The monochromatic images are then produced by superimposing the individual frames, correcting for the telescope offsets ; this ensures that the complete field is well covered. This procedure is not simple, as the observing conditions may change slightly from exposure to exposure, resulting in small differences. Finally, the combined images in each filter are aligned and colour-coded to produce the colour picture. For the processing of this large photo (8k x 8k; 256 Mbytes), a minimum of contrast correction was made and very faint lines may still be perceived in some places where the individual frames were joined. It may also be noted that there is a slight misalignment of the individual colours in stellar images at the extreme corners of the large field. This is due to the effect of differential atmospheric refraction, i.e. light rays of different colours are bent differently in air. The exposure time was 300 sec for each frame in H-alpha, and 60 sec in B and V. East is to the left and North to the top.